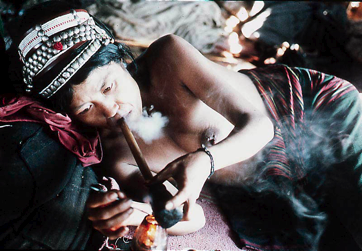 In the mountainous regions of northern Laos, consumption of opium is officially tolerated among tribal people. Most of men are smoking to the point they can’t do anything. Women are assuming almost all the laborious works in addition to the ones from the daily family life. Their lives become so exhausting that in their turn they start smoking opium. Entire villages are dependent of the drug. The Lao government does not seem to discourage the practice. The Lao Army swap opium withdrawn from the previous crop of the tribal people for their reserve of rice and corn.